Micron announced its first 3D NAND chip for mobile devices with the goal of cramming more storage into handsets, and maybe reducing reliance on SD card slots. 3D NAND provides more capacity in the same size chip than other technologies can. Micron's 3D chip has 32GB of capacity and is targeted at mid-range and high-end phones. It's based on the new UFS 2.1 standard, a fast storage protocol that isn't in smartphones yet. Micron believes internal storage capacity in smartphones will need to grow, especially with new applications like virtual reality and streaming video. Low-end smartphones have as little as 4GB of storage, while the iPhone 6S has up to 128GB. Micron's goal is to cram even more bits into its 3D NAND mobile chips as it refines the manufacturing process, said Gino Skulick, vice president at Micron’s mobile business unit. In a few years, internal storage capacity in smartphones could be as great as it is in PCs today, perhaps up to 1TB by 2020, Micron said. But the company didn't provide a roadmap of the storage capacity it will provide in its 3D mobile flash chips. 3D NAND chips are already in SSDs from companies like Intel, and the density they offer is only growing. 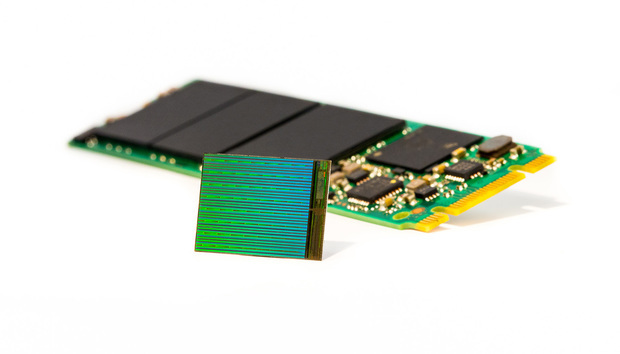 Micron has said it can cram more than 3.5TB in gumstick-sized SSDs. The flash chips pack storage cells vertically, like floors in a skyscraper, allowing for higher capacity and faster communications between chips. Current 2D NAND chips have storage cells placed next to each other. Micron's top competitor is Samsung, which makes 3D flash chips used in handsets like its Galaxy S7 and Note 7. Those handsets have a maximum of 64GB of capacity, after which users can expand storage capacity with SD cards. Samsung has also been using 3D flash to increasing the storage capacity of its enterprise SSDs. In March, it shipped an SSD with a whopping 15.36TB of storage. Micron's 32GB 3D flash chip will ship to device makers in the second half of next year. The chips were announced at the Flash Memory Summit being held in Santa Clara, California.